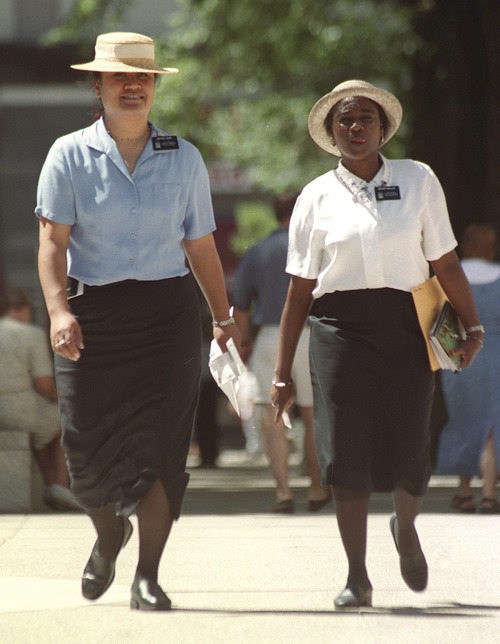 A dark-suited pair of Mormon missionaries may be the most recognizable symbol of the Utah-based LDS Church. 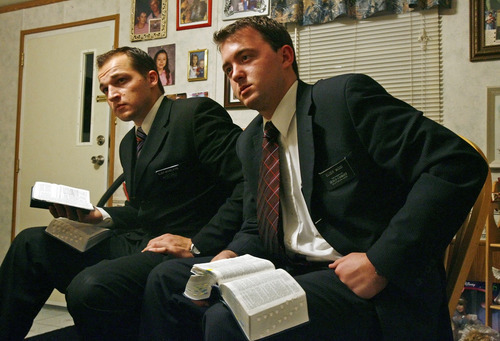 These clean-cut, prim-and-proper proselytizers come to your door. They bicycle down your street. They stand on street corners in front of large posters to tell you about their church and its history. You might know that these volunteer preachers serve full time for a certain length of time. You might know that although young men make up the vast majority of this 52,483-strong force, they are hardly the only Mormons who go on such missions. You might know that many, but not all, come from Utah. You might even know that there are places they can't go and things they can't do. • They  or their families  pay $400 a month to cover their mission costs, whether they are in expensive England or bargain Bolivia. The church covers the rest. • There have been full-time missionaries serving from Pakistan for years. Currently there appear to be about 30 Pakistani Mormons on missions worldwide  with about 20 of them serving in their own country (constituting that nation's entire LDS missionary force). • There appear to be more members serving full-time missions from Utah than any other state, but California boasts the most missions and has the most full-time missionaries assigned to it. • Male converts who are polygamous must divorce all but one wife and be interviewed by the mission president to be baptized into The Church of Jesus Christ of Latter-day Saints. • In most of Africa, the Philippines, Southeast Asia and a few other hot locales (think Texas), missionaries don't have to wear jackets (except for conferences). In Fiji and some other Pacific islands, elders (as young male missionaries are called) frequently don traditional skirts called lava-lava. • Inez Knight and Lucy Jane (Jennie) Brimhall, assigned to serve in Great Britain in 1898, were the faith's first single, official, proselytizing female missionaries. • Last year, the church changed its dress code for "sister" (female) missionaries, allowing them to forgo pantyhose or stockings and to shorten their skirts above mid-calf. But the skirts are still required, according to the church's website, "to cover the knees when sitting or standing." • The age of availability for male missionaries recently was lowered to 18 in Germany, the United Kingdom, Albania, Cape Verde, Spain, Italy and all of South America to accommodate educational and military requirements. For the rest of the world, young men generally cannot go until they turn 19. • Portugal, Chile and South Korea reportedly have the lowest retention of LDS converts at 12 percent; Burundi, with two branches and more than 150 members, has about 85 percent activity, which may be the highest retention. For countries with a larger LDS presence, the Democratic Republic of Congo has just under 30,000 members in 100 congregations, which puts its retention rate at about 75 percent. • In 1972, a Mormon missionary in Bangkok climbed on a statue of Buddha to have his picture taken. It was a huge embarrassment for the church and the missionary was sentenced to a year in prison, but released after six months when the king of Thailand pardoned him. Now all missionaries are instructed in cultural sensitivity. • The church openly proselytizes in a handful of predominantly Muslim nations, such as Albania and Sierra Leone; whereas in most such countries, such as Lebanon and Pakistan, missionary work occurs through member referrals. Proselytizing  and even giving a Book of Mormon to someone who asks for it  is strictly forbidden in Israel. 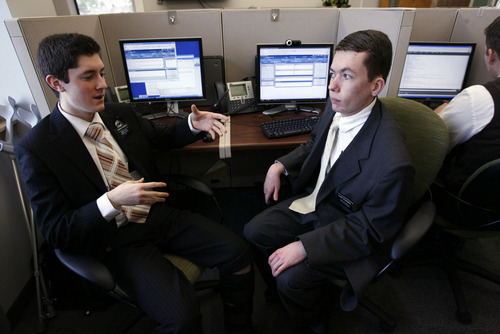 • The first LDS missionary from Uzbekistan recently began his mission (he is Korean-Uzbek). • Missionaries in some missions (the West Indies, Papua New Guinea) occasionally travel by canoe. • More than a million Mormon men and women have served missions for the LDS Church since its founding in 1830. • Most missionaries are schooled for full-time service in Provo at the church's largest training center, but there are 14 smaller centers around the globe. • About 80 physicians serve as full-time volunteer missionaries around the world "so mission presidents have access to the best medical advice they can possibly get right within the boundaries of their own areas," according to the church's website. Also, an additional 200 volunteer nurses and others with medical and health-care backgrounds "are out there shepherding this missionary force." • After the Middle East's Six-Day War, two Mormon missionaries in Beirut were thrown in jail, accused of being "Zionist CIA agents." • Female missionaries can have hair of any length but, if they color it, the church website says, it "should look natural and conservative." Those who do color it, should "consider time, frequency and cost." Perfume should not be "distracting or overpowering." • The missionary rule book, which spells out every aspect of mission life from what time to wake up (6:30 a.m.) to the time to go to bed (10:30 p.m.)  and nearly everything in between  is found in a small booklet every missionary packs. It's dubbed "the white Bible." • Male missionaries are expected to maintain conservative, short hairstyles with a visible part. Sideburns can reach no lower than the middle of the ear. No bowl cuts, crew cuts, shaved or bleached hair, or wet-looks are allowed. • Barring emergencies, missionaries are allowed to email their families once a week and can call or Skype home twice a year  Christmas and Mother's Day. 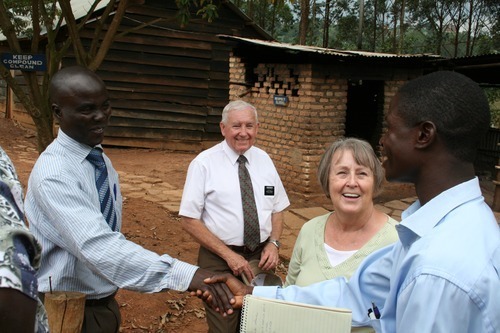 • There are nearly 100 missionaries in Uganda, setting for Broadway's "Book of Mormon" musical about LDS missionaries. They haven't converted any warlords yet, but several battle-scarred warriors have joined.